You know the saying, "Good thing come to those who wait"? It's true, but sometimes it's just so hard to follow. As a rule I try to wait to purchase things on sale, unless I feel like it's something I absolutely can't live without. (I know, I know... clothing and accessories are not a matter a life or death, but you know what I mean!) However, it's always frustrating when you play the waiting game too long and then miss out on something you later regret. For months I had a wish list of things that I wanted at Zara from their Spring collection. I really like Zara because you can buy some pretty high-end looking items, many which are made in Spain, and the retail prices are reasonable. Trying to be good, I figured I didn't need anything off my wishlist right away and if I waited a few months everything would go on sale. During Zara's first sale cut I refrained from getting anything. During their second cut, pretty much everything I wanted was sold out online. C'est la vie! Lucky for me I got a second chance on a recent trip to Zara last weekend. They had everything I wanted on my wish list in my size, including this blue and white floral top that I've been lusting after. When I was in the dressing room trying it on I thought I should buy some white pants to go with the top. I ventured next door to J. Crew and found a pair on sale for $14! My ensemble was officially complete. I guess good things really do come to those who wait! I've seen that top in person. Didn't like it on me but I love it on you. Definitely worth the wait. I purchased a tank, a skirt and a dress (all on sale) from Zara just this week. I say for sure, definitely worth the wait. Thanks Ada! I was really surprised that Zara still had an excellent selection of things given how long the sale has been going on. Can't wait to see what you scored! That top is gorgeous! 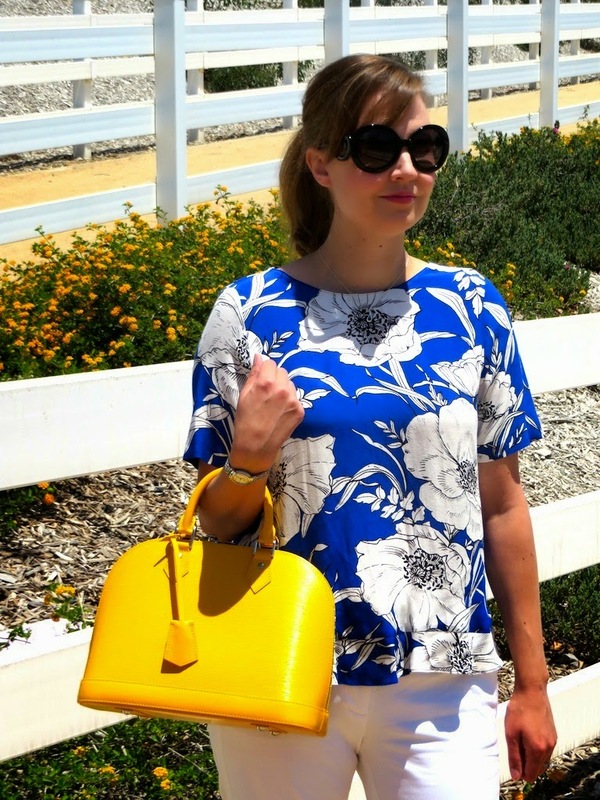 And I love the pop of color with the purse, Katie! Thanks Laura! I wasn't sure if I should go with yellow or pink. Maybe a pop of pink next time around!? Thanks Johanna! I think it might be one of my most used bags! Sounds like fashion luck was on your size when you went to Zara! Isn't is great when that happens? Love that top. And the yellow bag is perfection! I know! I love when that happens. It's fashion fate!